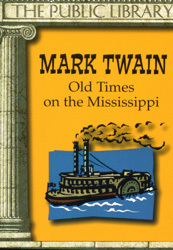 In Old Times on the Mississippi Mark Twain gives a guided tour down the great river from St. Louis to New Orleans. "When I was a boy," he explains, "there was but one permanent ambition among my comrades in our village on the west bank of the Mississippi River. That was to be a steamboatman." Well, Mark Twain became a steamboat pilot and here is his famous story of that experience. Part of the Public Library Series designed for the traveler, the commuter, readers who prefer their books to be portable yet substantial, easily affordable and handsomely packaged. Here, too, is the perfect choice for that spur-of-the-moment hostess gift, stocking stuffer, bar mitzvah or Easter basket. Each volume is only slightly larger than a deck of playing cards, costs only $4.95 but in 192 pages provides a complete work of substance and quality that will fit easily into a purse or the pockets of a business suit.